Illinois beat No. 9 Michigan State, 79-74, at home on Tuesday, and has now won three of its last four, all as an underdog, with two victories over top-15 opponents. The Illini, who were getting 10.5 points against the Spartans, blew a 14-point lead in the second half, but they never trailed after Ayo Dosunmu hit 3-pointers on back-to-back possessions. Illinois beat No. 9 Michigan State, [79-74, at home on Tuesday](http://www.espn.com/mens-college-basketball/recap?gameId=401082353), and has now won three of its last four, all as an underdog, with two victories over top-15 opponents. 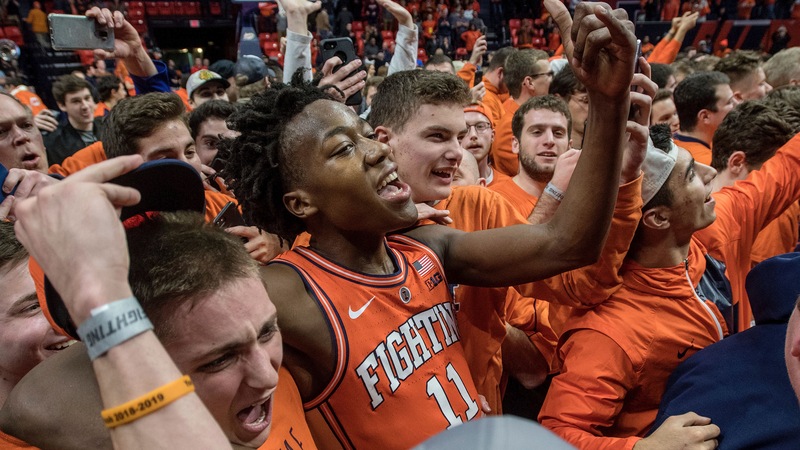 The Illini, who [closed as 10.5-point underdogs](https://www.betchicago.com/college-basketball-betting-lines-odds-predictions-kansas-state-favored) against the ninth-ranked Spartans, blew a 14-point lead in the second half, but they never trailed after Ayo Dosunmu hit 3-pointers on back-to-back possessions, the second with 1:57 left after his steal gave Illinois back possession. Dosunmu scored a game-high 24 points, scoring 8-of-14 from the field. <a href="https://www.youtube.com/watch?v=M3SUP-bh4bo" class="embedly-card" data-card-width="100%" data-card-controls="0">Embedded content: https://www.youtube.com/watch?v=M3SUP-bh4bo</a> The Illini (8-15, 4-8 Big Ten, 10-13 against the spread) haven't had much to celebrate this season, but the fans in Champaign got to storm the court for the first time since 2013, giving their moneyline bettors an 5/1 payout. <a href="https://twitter.com/betchicago1/status/1092973517602058240" class="embedly-card" data-card-width="100%" data-card-controls="0">Embedded content: https://twitter.com/betchicago1/status/1092973517602058240</a> Illinois beat then-No. 13 Maryland by 11 on Jan. 26 at Madison Square Garden as 8.5-point dogs, and then, after an 11-point loss at Minnesota getting 7.5, the Illini beat Nebraska at home, 71-64, taking 2.5. The Spartans (18-5, 9-3 Big Ten, 16-7 ATS) have now [lost three in a row](https://www.betchicago.com/saturday-college-basketball-betting-recap-february-2) SU and ATS following a 13-game winning streak (12-1 ATS). The game also went OVER its total of 148, the second straight OVER in a Michigan State game following six straight UNDERs. __MORE:__ [Iowa State bettors crushed by Oklahoma 3-pointer that shouldn't have counted](https://www.betchicago.com/college-basketball-bad-beat-iowa-state-bettors-crushed-oklahoma-feb-4) ## Boston College-Duke bad beat The Eagles, 23.5-point underdogs, lost at Duke, 80-55. BC held a halftime lead and trailed by 16 with 3:50 left. But the second-ranked Blue Devils (20-2, 8-1 ACC, 14-8 ATS) finished the game on a 12-3 run, including Alex O'Connell jumper with 41 seconds left that were the final points of the game. The Eagles (11-10, 2-7 ACC, 10-11 ATS) missed two 3-point attempts in the final half-minute. ## N.C. State's offense bounces back, but Wolfpack still fail to cover North Carolina State had a [historically bad performance Saturday](https://www.betchicago.com/saturday-college-basketball-betting-recap-february-2), scoring only 24 points in a home loss to Virginia Tech, the worst offensive output int he shot-clock era. The Wolfpack increased their point total by a whopping 72 points Tuesday at Chapel Hill ... and still couldn't cover a 10.5-point spread in a 113-96 loss to No. 8 North Carolina. ## Marquette loses rare one in Milwaukee The Golden Eagles share the new Fiserv Forum with the Bucks, and they had won all 14 of their games their until Tuesday, a 70-69 loss to St. John's. No. 10 Marquette (19-4) now has two Big East losses, and both have come against the Red Storm, which was getting seven points on Tuesday. St. John's blew a 15-point, second-half lead, but junior guard Shamorie Ponds (game-high 28 points) made a layup with 20 seconds left, and Markus Howard missed a jumper at the other end. Howard, Marquette's star junior guard who is averaging 25 points per game, has shot 7-for-32 (22 percent) from the floor in two games against St. John's this season. ## Kansas State breaks skid against Kansas The Wildcats snapped an eight-game losing streak against its rival, earning a 74-67 win as a 3-point favorite over the visiting Jayhawks. No. 13 Kansas has now lost six of seven ATS. ## Other top-25 favorites that covered Tuesday No. 5 KENTUCKY (-16) over South Caroina, 76-48 No. 7 Michigan (-9.5) over RUTGERS, 77-65 No. 20 Florida State was a 3-point underdog at Syracuse, and dominated the Orange at the Carrier Dome, 80-62. Top-ranked Tennessee cruised to its 17th straight win, but couldn't cover a 19-point spread in a 72-60 win over visiting Missouri. __PLAY:__ Our [free contests to win BetChicago prize packs](https://betchicago.chalkline.com). Pick NBA, college hoops, hockey and UFC 234 in Melbourne for a shot to win.